Acquisition of a chronic subdural haematoma during training for competitive race walking? A 65 year old man, anticoagulated for cardiac problems, developed hemiparesis while training for race walking. 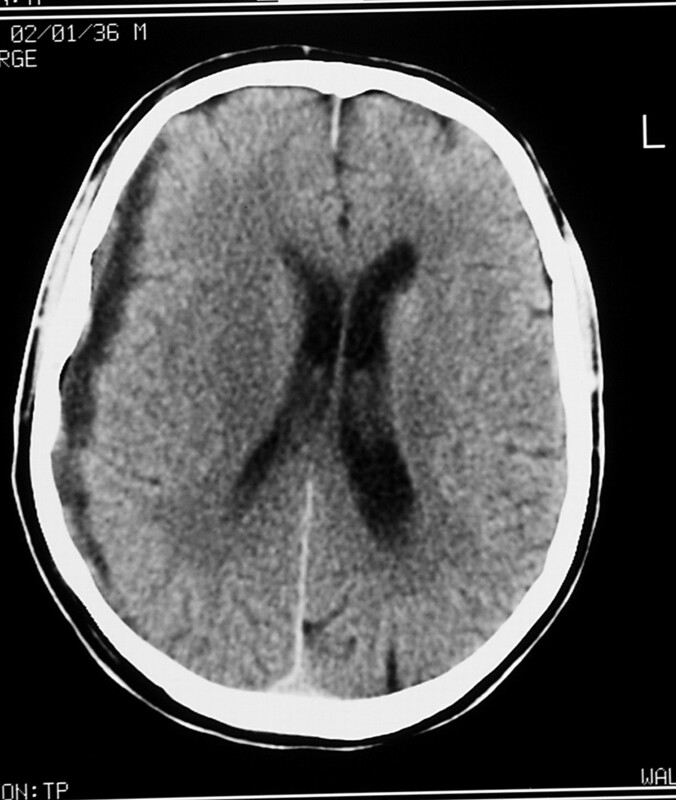 A computed tomography scan showed a chronic subdural haematoma. This is the first report of a chronic subdural haematoma possibly caused by the jarring action of race walking. Race walking is a physically demanding sport, commonly resulting in musculoskeletal injuries; however, injuries to the central nervous system are more rare. Competitors tend to be in good physical condition, particularly with respect to their cardiovascular systems. We present the case of a regular long distance walking competitor who developed a chronic subdural haematoma while taking warfarin, possibly as a result of his sporting activity. A 65 year old retired man was admitted to our unit in late autumn. He was right handed, a non-smoker, and rarely consumed alcohol. He had previously been in good health and had race walked for many years. During a race three years previously, he had developed an unexpected attack of breathlessness, later diagnosed as a myocardial infarction. Echocardiographic investigation showed aortic regurgitation requiring anticoagulation with warfarin. He then continued training and racing without a problem, until a few months before attendance at our unit. During the summer, he began to develop mild bifrontal headaches, quite vague in nature, through which he was able to continue training. In early autumn he suffered a minor head injury from banging his head on a recently painted roof corner while at work. He had not lost consciousness and did not subsequently notice any change in the pattern and severity of his headaches or any new weakness or additional symptoms. Indeed the head injury was so minor that he had been able to continue his duties without being sent home. Two weeks before transfer to our unit, he was training on a particularly cold windy day, when he developed a foot drop on his left side and weakness of his left arm, both on the windward side. His balance had become unsteady and his coordination poor. Initially he thought he was hypothermic and returned home; however, after he had warmed up, he found that the weakness remained. A computed tomography (CT) scan of his head showed a large right sided subdural haematoma with considerable midline shift (fig 1) and he was transferred to our unit. On arrival he had a Glasgow coma score of 15, with left sided pronator drift and a left hemiparesis of 4/5. There was no dysarthria, and cranial nerve examination was normal, as were his reflexes. Computed tomography scan showing right sided, hypodense, subdural haematoma causing midline shift and ventricular compression. After the administration of fresh frozen plasma to reverse the coagulopathy (international normalised ratio (INR) 1.6), he was taken to theatre. 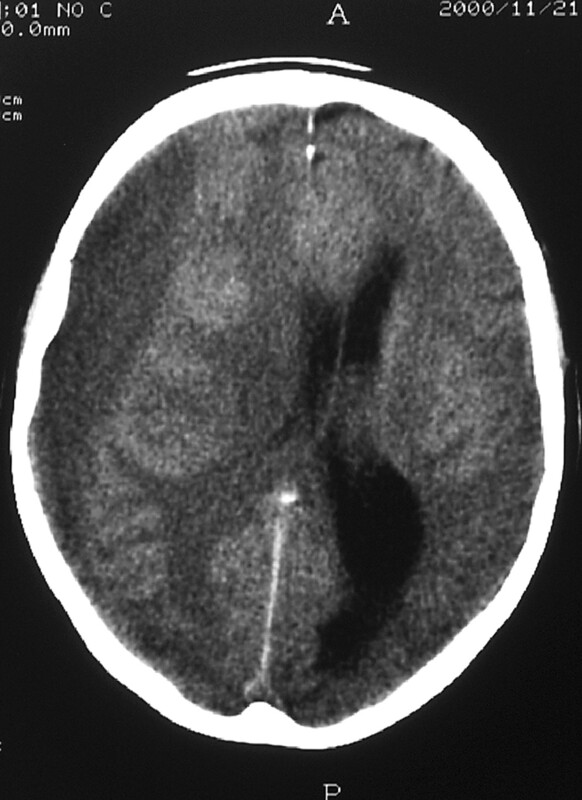 The subdural haematoma, comprising dark thick old blood under pressure, was evacuated via burr holes. After surgery, his weakness resolved, and he resumed taking warfarin without incident, being discharged seven days after admission. The CT scan (fig 2) confirmed re-expansion of the ventricles and partial alleviation of the midline shift. Computed tomography scan confirming decompression of the haematoma, re-expansion of the ventricles, and near realignment of the midline structures. At the six week follow up, he reported that all was well, and full strength had returned to his left arm. He retrospectively realised that he had had a small degree of weakness and incoordination after the onset of his headaches but before his head injury. Subdural haematoma can occur in acute and chronic forms. Acute subdural haematoma is usually caused by high speed injury, the accumulated blood leaking from bridging veins on the surface of the brain, damaged by the sheering forces of the head injury or from contused brain. This new blood appears as a hyperintense bright area on CT scans. Chronic subdural haematoma are more common in the elderly. They may be precipitated by minor trauma, and there is increased incidence in alcoholics, epileptics, and patients receiving anticoagulant treatment. The CT appearances are of hypodense dark areas representing collections of altered blood. Vigorous activity in patients taking warfarin could have the potentially fatal consequence of subdural haematoma accumulation. Doctors should consider the benefits and risks of anticoagulation before prescribing warfarin to active sportsmen and women. It is probable that our patient's haematoma developed at the time that his headaches started. This is suggested by the hypodense appearance of the haematoma on his CT scan. The absence of hyperdense new blood on the scan suggests that the sudden onset of weakness was not due to an acute haemorrhage but rather represented decompensation. It is interesting that the symptom of weakness developed while he was race walking. The patient described the jarring action of straight legged race walking as being quite substantial, particularly during walking downhill. This was a much greater jarring force than that of his previous head injury. It is possible that his subdural haematoma was a direct result of his sport, although this is not confirmed. This case report has been presented as a poster at the International Symposium on Concussion in Sport, 2–3 November 2001, Vienna, Austria. Jones NR, Blumbergs PC, North JB. Acute subdural haematomas: aetiology, pathology and outcome. Aust N Z J Surg1986;56:907–13. Ross RT, Oschner MG Jr. Acute intracranial boxing related injuries in US Marine Corps recruits: report of two cases. Mil Med1999;164:68–70. Sawauchi S, Murakami S, Tani S, et al. Acute subdural haematoma caused by professional boxing. (In Japanese.) No Shinkei Geka. Neurological Surgery1996;24:905–11. Cruikshank JK, Higgens CS, Gray JR. Two cases of acute intracranial haemorrhage in young amateur boxers. Lancet1980;1:626–7. Pothe H. Chronic subdural haematoma in prize fighters. (In German.) Beitrage zur Neurochirurgie1964;8:232–7. Keller TM, Holland MC. Chronic subdural haematoma: an unusual injury from playing basketball. Br J Sports Med1998;32:338–9. Lindsay KW, McLatchie G, Jennett B. Serious head injury in sport. BMJ1980;281:789–91. Snyder RW, Sridharan ST, Pagnanelli DM. Subdural haematoma following roller coaster ride while anticoagulated. Am J Med1997;102:488–9.